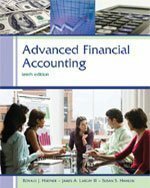 Advanced Financial Accounting, 10e is designed to serve either the undergraduate or graduate level of advanced accounting. It features logical structure and careful explanation of complex topics to enhance instructor teachability and student comprehension. The text provides complete coverage of accounting and reporting for mergers and acquisitions, including business valuation, consolidated financial statements, foreign currency translation and transactions, derivative financial instruments, state and local governments, not-for-profits, partnerships, and bankruptcy. Susan S. Hamlen, Ph.D. (Purdue University), CFM, CMA is Associate Professor of Accounting and Chair of the Department of Accounting & Law, State University of New York at Buffalo. She is a member of the American Accounting Association and the Institute of Management Accountants, where she has served in various directorships. Articles by Professor Hamlen have appeared in The Accounting Review, the Journal of Econometrics, the Southern Economic Journal and other journals. Professor Hamlen has been active in executive education programs, and teaches undergraduate and graduate courses in financial and management accounting. Previously he served as an Associate Editor of Accounting Horizons (1989-1994), as President of the Financial Accounting and Reporting Section of the AAA, and as a member of the FASB Task Force on Consolidations and Related Matters. Professor Largay teaches undergraduate and graduate courses in financial accounting and financial statement analysis.